As North America looks ahead to Monday’s solar eclipse, Charlottesville writer Betty Joyce Nash looks back to a time when the world seemed smaller and easier to comprehend. She calls this essay Totality. In March 1970, I stood at the edge of the Atlantic while the world throbbed. I was at Sandbridge. Somehow my roommate, Lee, and I had found transportation to this island, her home beach; she came from Newport News. 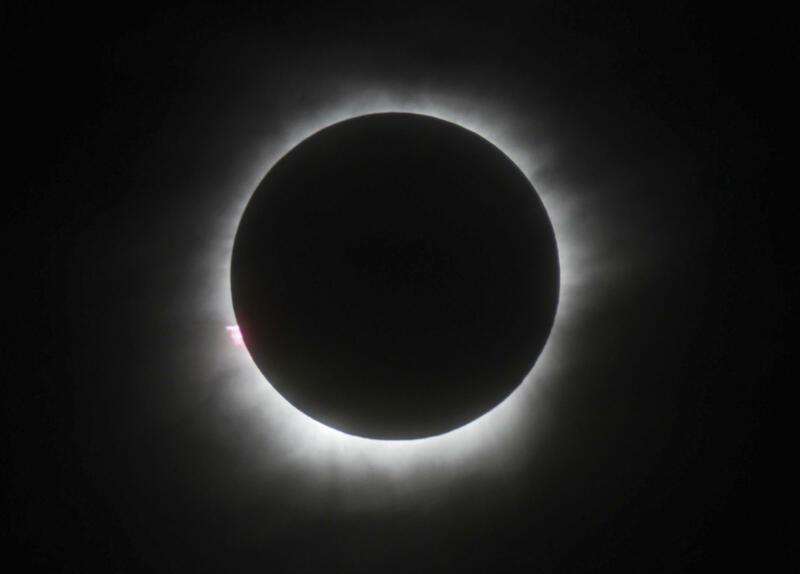 We’d heard about this cool happening: a total eclipse of the sun. None of us even knew what that meant, except maybe this guy, Tom, whose dad worked for NASA. The next one was years and years away, he said. It’d be a bummer to miss something this big. I knew nothing about space. I didn’t even know the sun was a star, in a galaxy among galaxies. What was a galaxy anyway? And, at eighteen, time had no meaning. I’m not sure why I even tagged along. Probably, since we attended a woman’s college (in six months, the courts would force the University of Virginia to admit its first female freshmen), I had nothing better to do that weekend. Instead of dating on weekends, I rode my bike to the junkyard for “mixed media”—gears or odd metal contraptions I couldn’t identify, trying to make sense of the physical world by building “art stuff” from what society dumps. So I got plenty excited when Son of NASA taught us how to make those pinhole cameras. We knew not to look directly at the sun, but nobody’d heard of eclipse glasses. Probably only NASA people had those. We drifted along the beach. Waiting. For what? I didn’t know. The day darkened. With our backs to the sun, we stared hard at our rectangles. A tiny shadow-moon advanced across the cardboard. Unspectacular. Bored, we raised our heads and looked around. Not at the sun, at the world: the vast stretch of wet, wave-marked sand seemed to undulate, the sea slapped the horizon. I’m a South Carolina sandlapper. I’d seen plenty of beaches. But this wasn’t about the beauty of the beach. The day shaded sepia—an eerie not-dark, not-light. The wet sand shone and vibrated with leftover radiance. For a split second, at totality (Son of NASA said it was OK), we peeked at the sun. Its gold ring edged the moon and made the sand and water purple. The wind whipped my corduroy bell-bottoms around my ankles. My sneakers squished as we walked the deserted sand. We were practically the only ones on the planet, only a few alien beings nearby. I understood something new about myself, about this rock in space, and my place on it. Everything’s bigger and more mysterious than we know. Something I could only have learned in those three minutes of totality. There’s a totality we’re missing right now, after what happened here in Charlottesville last week, a totality we’re forgetting or ignoring or shredding. Darkness in full day is a miracle. A cause for awe. A pause for each of us to stand still for a moment and ponder who we are on this rock, and recover our reverence for the experiment that brought us into this time and place.